Review date: 11 October 2001. Removable IDE hard drive racks have an unglamorous history. The basic idea of the things is very simple. There's a tray with a fold-out carry handle, and into that tray you can screw a standard 3.5 inch hard drive, or other 3.5 inch half height IDE device. 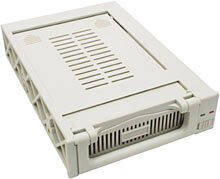 The tray slides into a frame, and the frame mounts in a 5.25 inch drive bay. Add a multi-pin plug and socket arrangement at the back for power and data, put standard drive connectors on the back of the frame, and bingo, one removable drive on the cheap. Buy multiple frames and install them in more than one computer and you can transfer drives between PCs, which gives you a simple way to sneakernet large amounts of data from computer to computer. Buy multiple trays and you can swap a computer's boot drive for any of a number of others in seconds, which is an appealing solution for some multi-operating-system applications. Install multiple drive racks in one computer and you can exchange whole drive arrays at will, which is handy for people doing video editing and other storage-intensive tasks. Remove a data drive and store it in a fireproof safe and you reduce the chance of data loss through fire or theft considerably. The safe could also, more sensibly, contain a few trays each holding a drive used for backup purposes; this is a neat and fast alternative to tape backup systems. First, normal IDE host adapters do not like it when you add or remove drives with the computer turned on. Nothing's likely to explode, but your operating system will probably hang if you disconnect drives while it's running. Just turning already-connected drives off will do the same thing. And if you add or turn on a new drive while the machine's running, it won't see it. Second, plain drive racks are no good for multi-location use unless you buy and install multiple frames in the computers to which you want to take the drive. And you may or may not even be able to buy frames or trays separately. If you can't, you'll end up paying for a surplus of one or the other item. Third, commodity 3.5 inch hard drives are not made to be portable. They've got massive capacity and minuscule prices, they're very pleasingly speedy, but they don't like being knocked around. Drive racks just don't have enough room to put any padding in between the drive and the tray holding it, so when you've got the drive out of the computer, do try not to drop it. If you whang your drive off the side of your half-ton safe in the process of trying to put it safely away, you're likely to feel a bit of a goose. No normal removable drive rack can do much about the fragility of the drive you put in it. But here's one that quite elegantly deals with the second problem, and with some extra software has a stab at the first one, too. 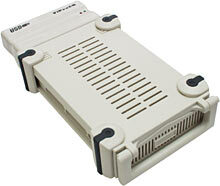 This is Vipower's VP-8058 USB MobileRack. They seem to want people to call it the "MobileRACK", but I'm not inclined to extend them that typographical courtesy, seeing as they render their name in their logo as "ViPowER", which is just rude. They may be the first company to use studlycaps. ...but when you remove the drive tray, you can click an extra module onto the end of the tray, and turn the MobileRack-ed drive into an external USB device. In that mode, it can be used with any USB-capable Windows PC or Mac. Including laptops, which obviously aren't candidates for normal drive rack installation. USB 1.1 (the standard flavour at the moment) is a much slower transfer method than plain Ultra DMA/33 IDE, but if you can live without full speed operation in return for a neat-o no-rack solution, this looks like a quite nifty solution. The new USB version 2.0 is much faster, but there are practically no USB 2 devices around yet (controllers are easy to find, but things to plug into them aren't), and the Vipower rack only supports v1.1. For $AU253 delivered from Aus PC Market, though, the VP-8058 is only about $AU100 more expensive than the fancier IDE-only racks. If the thing works, it could be just what a lot of people are looking for in a high capacity removable storage solution. Here's the whole VP-8058 kit. You get the drive tray and frame, there's the "USBdock" module for the back of the tray, and there's a lightweight switch-mode power brick to run the drive from in USB mode. You also get four clip-on foot thingies that let the USB-mode drive sit elegantly on a desk or stand on one side - modern hard drives don't care what angle they're used at. And there are driver floppies for Windows 98 and Mac OS, and a USB A-to-B cable. The front panel of the drive tray is removable, so you can install 3.5 inch removable media drives, like a Zip or LS-120 device, as well as normal hard drives. 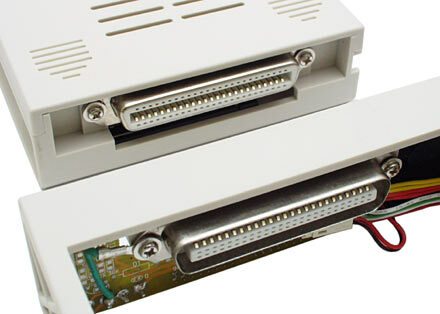 The back of the drive tray has a big solid Centronics-style connector that mates with the back of the frame (shown here), and with the USBdock as well. As is normal for drive racks, the connector isn't all that holds the tray into the frame; there's a combination power-and-lock switch at the front of the frame, as well. When the switch is in the off/unlocked mode, the drive isn't powered and you can pull the handle out to disconnect the tray. When the switch is in the other position, the handle is locked. The USBdock, on the other hand, does connect to the tray with nothing but the big plug and socket, which is a bit of a weak link. It's not going to just drop out of its own accord, but it wouldn't take much of a mishap to yank it loose. Apart from its mildly questionable attachment method, the USBdock's an OK design. There's the USB port, a mini-DIN plug to connect the power brick to, a three-position power switch, and a separate five volt socket. I'm a bit confused about the function of that last connection, and the "USB" setting on the power switch. If you select that setting, I presume the USBdock just passes through the 5V power supply from the USB plug, or 5V from a plugpack connected to the second socket, if there is one. If you're using a 5V-only drive in the tray - a laptop drive, say - with low enough power requirements, then I guess this mode will work. 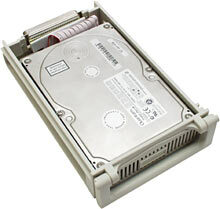 Normal PC hard drives need 12V power, though, and only work if you select the other, "Ext" power switch position, with the included power brick connected to the mini-DIN socket. The major task when you're setting up a drive rack is actually getting a drive into the tray. 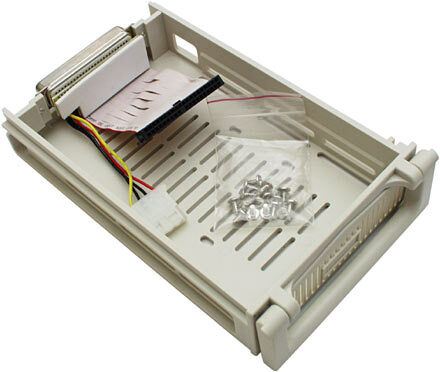 Some trays have awkward cable layout or inadequate drive mounting provisions. The Vipower tray isn't perfect, but it's good. 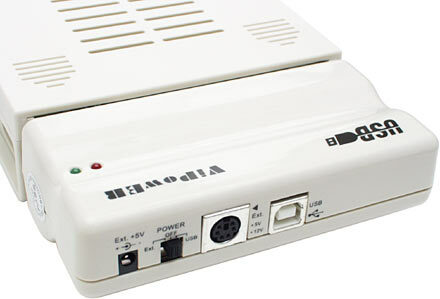 The tray has a short stub of 80-wire IDE lead with the usual 40 pin plug at the back of it - so you can try to use Ultra DMA/66 or /100 mode if you like, but the extra connections might give you slow and/or unreliable data transfers. There's also a standard four pin "Molex" power plug, which (in the tray I reviewed, anyway) is subtly larger than normal and is thus an exceedingly tight fit. You can get both plugs into a drive without too much trouble, though, and there's not so much cable as to stop you from getting your drive screwed into place. There are a plethora of holes and slots in the tray to match the screw holes in the side and base of any 3.5 inch device you care to name, and the tray comes with a selection of screws with different thread pitches - including some self-tappers - so that you should be able to attach any drive you like. Just make sure you're using a screw with the same thread as the hole you're screwing it into, or you'll strip out the hole. Drive chassis are usually made of aluminium, which is softer than even the cheap steel of the screws. One drive, installed. And the slide-on lid even went back on afterwards. Play with a few plastic drive racks and you'll learn that such luxuries are not guaranteed. Simple IDE racks, including this one in its non-USB mode, are very easy to install. You just set the master/slave setting for the drive inside as if you were installing it un-racked, then mount the frame like a normal 5.25 inch device, plug the drive tray into it, and power everything up. As far as the computer's concerned, it's just a normal new IDE drive. To remove the tray, you turn the computer off, unlock and yank the drive, then power back up again. No drama. Vipower have given the VP-8058 something closer to true hot swap capability, though, with an optional software package called Swap Manager. You can download an evaluation version of Swap Manager for free from here; it's $US19.95 to register it. There's a link to some quite good documentation for the package there, as well. Swap Manager has its limitations - it's not automatic, it only works in Windows 95 and 98, and if you want to use it, you have to install your drive rack or racks on the second channel of your motherboard's IDE host adapter, and nowhere else. If you meet those requirements, though, then clicking the "Swap out second channel" button in Swap Manager painlessly amputates the one or two drives you have connected to the second IDE channel, without killing Windows. You can then turn off and eject a rack-mounted drive or two. If you want to add a new drive, you plug it in, lock it and turn it on, and then click the Rescan button; presto, the contents of the second channel come back again. Simple enough. This strikes me as the sort of task for which somebody somewhere may have written a more elegant utility; if you know of one, tell me. But as long as you're only using Win95 or 98 and have a spare spot on your second IDE cable, Swap Manager seems to work fine. You don't need anything so fancy when you're using the drive in USB mode, of course. In fact, I'm happy to say that you don't necessarily even need to install a driver. Vipower include Windows 98 and Mac OS USB drivers for the USBdock-ed drive tray with the kit, and you install the Windows one in the usual fashion for USB storage. Don't just plug the gadget straight in; run the driver installer first, let it do its thing, then connect the drive, and Windows will happily find the newly installed driver waiting for it. If you've got Windows ME or 2000 or XP, though, you don't need to bother with the driver disk, because the drive just shows up as a USB Mass Storage Device. No driver, no fuss; just plug the sucker in and bing, you've got a drive. Nice. The last time I played with a gadget that worked this way (the Datafab CompactFlash reader I review here), I foolishly assumed that because the current version of Linux is supposed to support USB Mass Storage Devices, anything that said it was one would work on up-to-date Linux boxes as well. I was wrong about that, though; there is more than one flavour of Mass Storage Device, and just because it works under Windows doesn't mean it'll work on Linux. So you're on your own, there. Once you've got the USBdock-ed drive connected, it's easy to remove and reattach it. In Windows 95-series operating systems, you can plug or unplug USB storage devices at will, and the OS just deals with it. If anything is reading from or writing to the device when you remove it then it's likely to be very unhappy, but the thing's as hot-swappable as you can reasonably expect. In Windows 2000, all removable storage devices have to be manually "Stopped" before you remove them, to get the NT-series OS's fingers out of the file system. You can still just yank the cable if you want, but you may or may not get the drive contents you expect if you do, and Windows will say stern things to you about your poor judgement. Still, it's not as if you have to turn the computer off. I tried the MobileRack out with an unexciting 20Gb 7200RPM Quantum drive, and in IDE mode it performed as you'd expect. Big blocks of files copied back and forth between the rack drive, on the secondary IDE channel, and the computer's boot drive, on the primary IDE channel, at around ten megabytes per second, depending on the file mix. The rack drive was running in plain Ultra DMA/33 mode, which is what it's wise to stick with when you've inserted a couple of extra connector interfaces between a drive and the motherboard. The drive got warm during the tests, but not terribly hot; there's a dinky little cooling fan in the back of the MobileRack frame that does its best to keep a bit of air moving through it. Commodity 7200RPM drives are made to tolerate high temperatures, because they're commonly mounted hard up against other drives in airless underventilated mini-tower cases, and it's bad for a drive manufacturers' business if their drives die of heat stroke inside six months in such a situation. If you're feeling nervous about warm drives mounted in plastic racks, though, go for 5400RPM units. The speed difference is unlikely to matter much, the lower rotational speed means substantially less heat, and you won't have to futz around with extra fans. When I started testing USB mode transfer speed, I was ready to see something nasty happen. USB version 1 offers a maximum 12 megabit per second data transfer rate. This works out as less than one megabyte per second of real user data. That's not too awful, as long as you don't need to shift the entire contents of a 60Gb drive. Many USB storage devices, though, are a lot slower than you'd expect, and some USB-to-IDE bridge devices have been particularly horrid offenders. There are plenty of non-lousy USB-to-IDE devices around nowadays, but the bad old chipsets still show up from time to time. They often have OK read performance, but much slower write speed. Fortunately, the Vipower USBdock doesn't have such a problem. For file transfers from the rack to the host computer's hard drive, the USBdock-ed Quantum drive managed a highly creditable 0.92 megabytes per second. For transfers from the C drive to the rack, it was only slightly slower - about 0.86 megabytes per second. That'll do nicely, thank you. If you've been looking for... well, for this gadget, then this is the gadget you've been looking for. 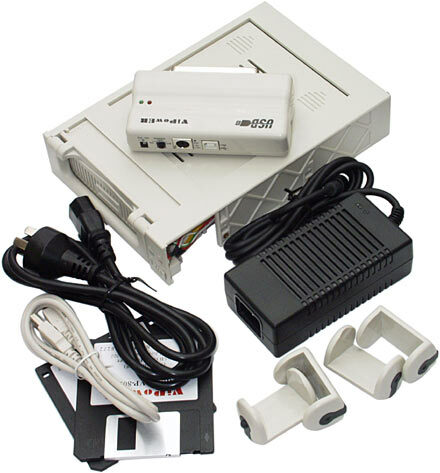 The VP-8058 is a good external USB box, with none of the nasty drive-installation, performance or compatibility quirks that plague the field, and the thing works as an IDE rack as well. So you get a handy combination of speed, convenience and compatibility. If you need super-speed storage all the time, the sub-1Mb-per-second performance of the MobileRack in USB mode won't be acceptable. But for many purposes, it'll be fine. And it'll work with any recent Windows PC with a USB port. If you're taking your drive to somewhere that uses WinME/2000/XP PCs, you won't even need to tote a driver floppy with you. OK, the MobileRack still doesn't offer much physical protection for your fragile commodity hard drive, but as long as you keep backups - and if you're carrying your drive around, you'd better - it's no great disaster if you drop your drive down a stairwell. With hard disk storage now costing well under one Australian cent per megabyte, it won't break the bank if you have to get a new drive. If you don't need to make a 3.5 inch IDE device portable, you don't need this gadget. But if you do, you'll probably love it. Recommended. Aus PC Market don't sell this model of rack any more, but readers from Australia or New Zealand can buy Vipower's current products, and lots of other drive racks, from Aus PC Market.